The CHATILLON® TCD Series is an advanced force testing system optimized for production, quality control and engineering applications. The TCD System consists of a powerful, yet easy-to-use console; a rugged frame upto 5kN load capacity, and an intelligent load sensing system with measuring accuracies better than 0.1% full scale. The TCD console features a high resolution color graphical display featuring menus, function and numeric keys and status indicators that assist the user in setup, operation and analysis. Information may be displayed in large-format tabular and graphical formats for easy viewing. The frame employs an advanced closed-loop PID controller for precision travel (accuracy better than 0.25% unloaded), ideal for applications such as spring testing where exact distance control is required. 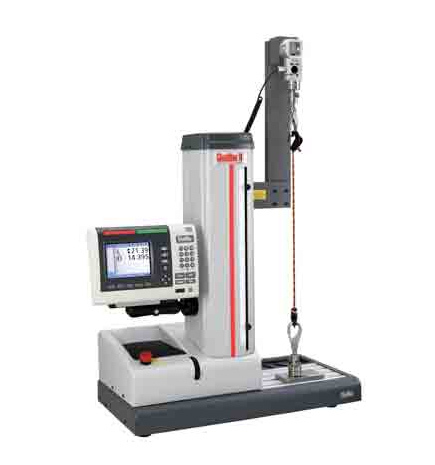 The TCD System permits the user to measure heights based on a datum or absolute position. Deflection compensation is standard. Standard test setups for load limits, distance limits, time limits, break tests, rupture tests, cycling and loop tests are included. No computer software is necessary. If data management and analysis is required using a personal computer, you may connect your TCD System with our optional TCD WEDGE application software. This lets you automatically transmit data to your personal computer in a Microsoft® Excel® format.